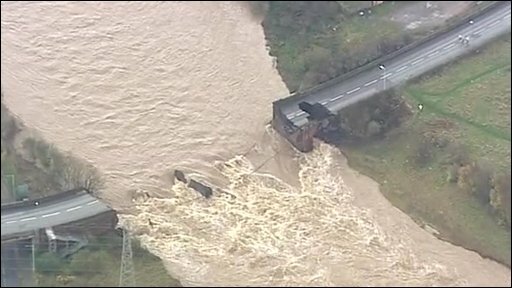 A police officer has been swept away after a bridge collapsed as major floods struck across Cumbria. A major search is being carried out for Pc Bill Barker, 45, who fell into the River Derwent when the A597 bridge was destroyed by floods in Workington. Cumbria Police said father-of-four Pc Barker had been directing motorists off the bridge when it collapsed. Meanwhile, about 200 people have been rescued by emergency services in the flooded town of Cockermouth. 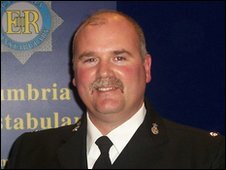 Pc Barker has been an officer with the Cumbria force for 25 years. Assistant Chief Constable Jerry Graham said: "I'm devastated by the events of the last few days and particularly the news this morning that one of our officers is unaccounted for following the collapse of a bridge at Northside in Workington. "Pc Bill Barker was directing motorists off the bridge, saving lives, when the tragic incident occurred. "A full and thorough search is underway and we are not losing hope of finding him." RNLI lifeboat operations manager Captain Brian Ashbridge said the lifeboat searching for the missing officer was forced back because of bad weather after three hours of Friday. He said: "There is a massive current coming down through the Derwent so, although the sea isn't very rough, conditions for the RNLI volunteers searching in the river basin have been very challenging. "It's absolutely horrendous. There is a huge amount of debris around in the water at the moment as well, which adds to the difficulties." Officers have warned people to stay away from bridges after water pressure also destroyed the Southwaite footbridge in Cockermouth and the nearby Lorton Bridge. Police have received a high volume of calls about missing people and more than 1,200 people were left without electricity overnight. The Environment Agency said the scale of the flooding was "unprecedented" and the Met Office said rainfall in some parts of the county had been some of the heaviest on record. By 0400 GMT police said floodwater levels in Cockermouth had stabilised, with rescuers able to reach people trapped in their homes by boat. Water levels in Keswick, which was also badly hit, were not expected to rise any further, police added. A police spokesman said: "The flood levels have stabilised enough to get boats in which is making the operation a lot easier." He added: "There have been no serious injuries as a result of the floods, just a few people treated at the scene for minor bumps and scrapes." RAF squadron leader Dave Webster said the air search and rescue operation was beginning to wind down, although a helicopter would remain on standby. Earlier, up to 20 people were thought to be trapped in their homes in the Main Street area of Cockermouth. Water levels in some parts of the town centre were more than 2.5m (8ft 2in). Lifeboat crews helped the RAF and mountain rescue teams to carry out evacuations in the town. Don Hindmoor, who was trapped inside a flat, said: "There's three people trapped in a one-bedroom upstairs flat. We've been stuck here all day. "We're not in any danger, it's warm enough, we still have electricity and so we're OK where we are for the time being, but there's a lot of people stuck in upstairs flats in this area. "It's not just water outside, it's raging torrents. It's like white water rapids." More than 200 Cockermouth residents spent the night in emergency reception centres. The centres have been opened at Cockermouth School, Keswick Convention Centre, Southey Street Methodist Hall and Skiddaw Hotel. Cumbria Police have opened a casualty bureau, for members of the public to telephone should they have any concerns regarding relatives, friends and family involved in the flooding incident. David Falcon, of the Environment Agency, said: "It is an improving situation across the county as most of our river levels are falling, albeit slowly. "The outlook for today is pretty good as it is just showers, our only concern at present is the rainfall that is forecast for tomorrow. "About 40mm is predicted, which is nothing like the levels experienced over the past 48 hours, but of course it is falling on saturated ground." 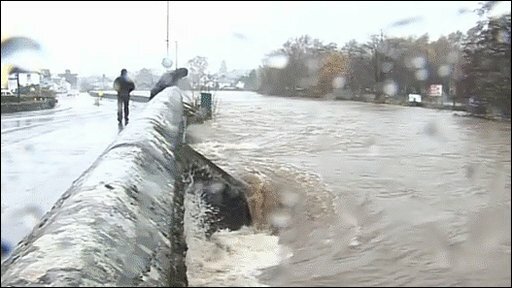 Four severe flood warnings remain in place on rivers in Cockermouth, Keswick and Eamont Bridge. There are reports of 370mm (14.5in) of rain falling in 24 hours at Seathwaite in the Lake District. Environment Minister Hilary Benn, who visited Cockermouth on Friday morning, said it may have "the wettest day ever recorded" in the county and that many defences built after the floods of 2005 had not been able to withstand the downpour. He said: "What we dealt with last night was probably more like one-in-a-1,000 flood, so even the very best defences, if you have such quantities of rain in such a short space of time, can be over-topped." Several major roads are closed and more than 70 schools have been shut, Cumbria County Council said. 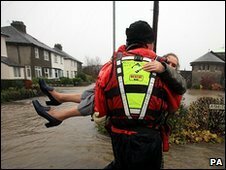 Scores of police officers and mountain rescue volunteers helped evacuate others in the town, where the River Derwent burst its banks. Are you in one of the flooded areas? What are conditions like where you live? Send us your comments and pictures.